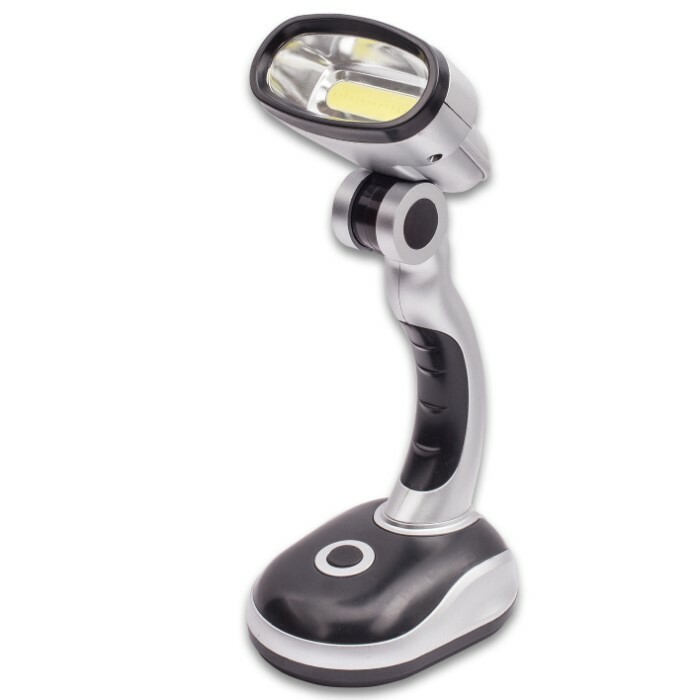 Ultrabright COB LED Table Lamp / Work Light | BUDK.com - Knives & Swords At The Lowest Prices! The Ultrabright COB LED Table Lamp will amply illuminate your work area, bedside or any other space for up to 100,000 hours. And because it runs conveniently on three AA batteries, there are no limits to where you can take this incredibly portable lamp. 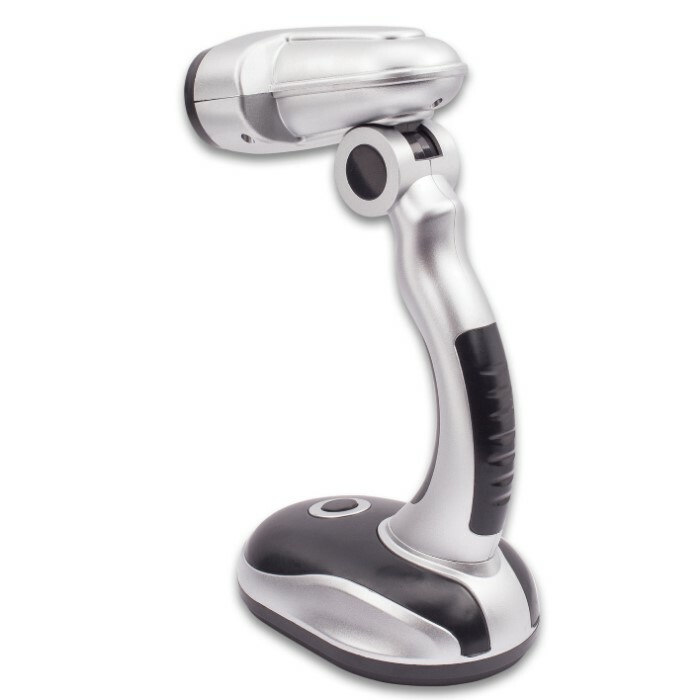 Use the adjustable pivoting neck to focus in on the task at hand. 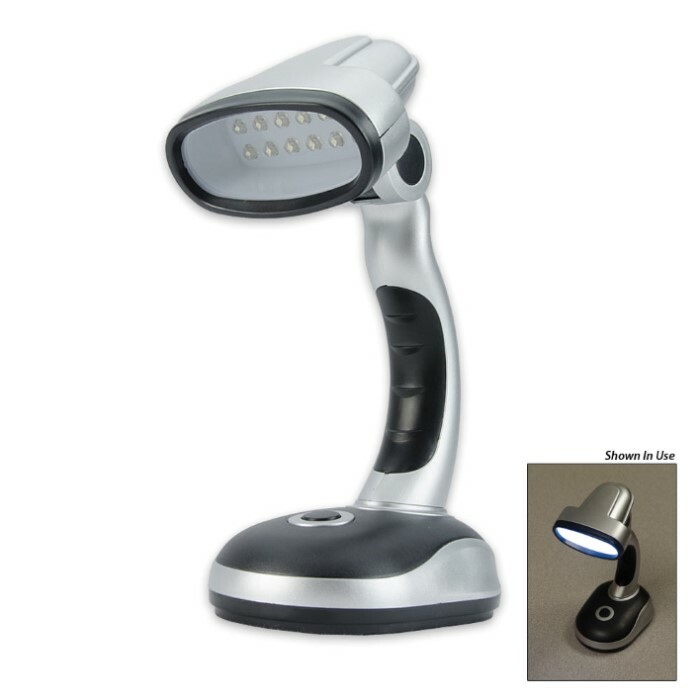 You'll find this cordless lamp so handy, you'll just have to get a second one! I don't understand why this things rating is low. Haha I love it. Brighter than I expected. Use it every night as a book light. I got my four dollars worth the first couple of days. I ordered one for me, one for mom, one for dad, and a second for me because it will eventually break as it was ONLY $4. The light works great...while it works. All LEDs are functional, which is a notable exception to the rule when it comes to these low-end LED lighting products. However, the "hinge" mechanism--the one that allows you to vary the vertical angle of the fixture's head relative to its base, is so stiff and lacking in any kind of tactile or aural feedback that I was sure I was going to break it the first time I made the attempt. But at the last instant, just as I decided to back off and live with it frozen at its current angle, it finally "gave." A horrible cracking noise accompanied the movement--a far cry from the smooth series of rapid-fire clicks I had been expecting-- but no physical harm appeared then or now to have been done to the fixture. Changing the angle--especially if there's a particular angle you're trying to achieve--is just harder to accomplish than it should be and than you may expect. But the biggest drawback to the light, by far, is the extremely short life offered by the (3) AA battery power supply. Mine, at least, is only good for an hour or so after being stocked with three brand new Energizers before it begins to dim noticeably. Oddly, this appears to be the case even if the light has not been in use and was turned off. This, of course, puts a severe crimp in the fixture's usefulness as a light source; a couple of hours in and you're ready to call in your second team of batteries. On the other hand, this may be a problem specific to my particular unit only, so I can’t tell you with confidence not to buy one of these under any circumstances (if I knew they all suffered from the same defect, I would tell you that very thing without any hesitation). Just be forewarned that it may well turn out to be a problem for you if you do buy one and plan accordingly. My score: Four stars for the first hour, two or one star after that.